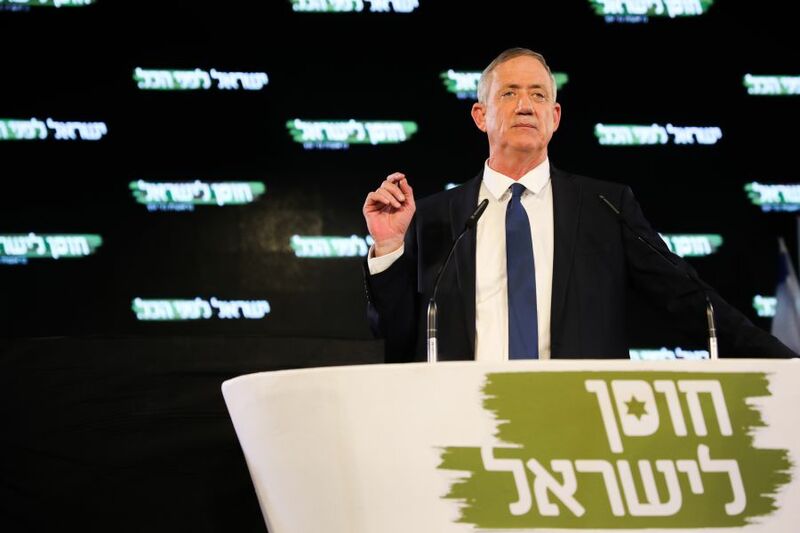 Benny Gantz, a likable, well-meaning, clean-cut figure, launched his bid to win the April 9 election in his first appearance on a political platform on Tuesday night, Jan. 29. But, as the speech unfolded, cheered repeatedly by an enthusiastic audience, a litany of well-worn truisms and slogans came rolling out. He may also have overreached himself when he repeatedly spoke in the character of the next head of government. Israeli political ground is littered with the bodies of numberless would-be prime ministers. He also erred when he accused the Netanyahus’ (without naming them) as behaving like the old French monarchs, a simile that will hardly resonate with the average Israeli voter. The new politician made the routine promises to expand the settlement blocs and retain the Jordan Valley. Israel will stay on the Golan forever. Jerusalem is the eternal capital of the Jewish people. But he did not refer to his plans for Judea and Samaria, a serious omission of a topic of major interest to the Israeli voter. Turning to Tehran, he promised that no threat to Israel’s sovereignty would be tolerated. He then challenged Iran’s Gen. Qassem Soleimani, Hizballah’s Hassan Nasrallah and Hamas’ Yahye Sinwar, and vowed to bring their rampages to a halt. His intention to revive extra-judicial assassinations of terrorist leaders was implied when he said that the liquidation of Ahmed Jabari in the Gaza Strip, which he ordered as chief of staff, would not be the last. At the end of his speech, he presented Moshe Ya’alon who had announced that he and his new party would join Gantz’s Israel Resilience List and run together in the April election. The announcement, after long negotiation, brings together two former IDF chiefs of staff. Ya’alon served, moreover, as defense minister when Gantz led the IDF in the Defensive Shield counter-terror operation in the Gaza Strip. Ya’alon gained at least two reserve spots for his candidates in the first 10 of the joint list. Its makeup has not been finalized. So far, only two have been named: Yoaz Hendel, a journalist, and Zvi Hauser, a former Likud cabinet secretary. Gantz and Ya’alon are shopping for additional parties, hoping they will jump aboard and help create a big opposition bloc dedicated to unseating the ruling Likud. Their ambition, however, is not supported by their initial appearance. They are indeed much-needed new faces on Israel’s political scene but have so far failed to deliver a strong new message or establish themselves as charismatic leaders and vote-catchers. lapid and gantz need to get together and decide who will be number one, and if they cannot agree, then they need to pick a third person to be number one. they will NEVER beat netanyahu unless that happens. Gantz is a real Yehudi warrior. Sharon was a warrior, as well. Little good did that do. Just like a college education does not mean someone has wisdom, or enlightened moral insight, likewise, a warrior does not mean he will make a good ruler. Besides, since the days of Sharon, no PM has the ability to do anything on their own. The government is ruled by too many average joes and skewered ideological law makers, that operate entirely by self-interest, which leaves the government with just a bunch of self-serving idiots. I should agree with Benny, perhaps, but Israel will be a great country only after the occupied territories Gaza and West Bank will be free of the invading fake refugees from Jordan and Egypt. Thank you, . . . I could not agree more. The fake refugees also came from Lebanon, Syria, Libya and the Gulf states before they occupied land that didn’t belong to them during the Muslim conquests. Reading the article, one might get the idea that Debka is a supporter of Binyamin Netanyahu? Then why does Debka focus its efforts on criticizing Bibi? To push him to the right, maybe? Nobody can be better to Israel than BIBI. With all their experience in the military, are their no jobs available for retired generals? Sharon, Barak, Rabin, Yaalon, etc. Israel shouuld be realistic. No one has experience ,which BIBY has. Ganz our new prime minister of Israel! Beni Ganz my new prime minister!! Bibi corapted! Welcome Ganz! Finally safe and honest voice!!! Good luck to you our dear new PM! I think it’s perfectly acceptable for a piggie to enter from the backside. In these trying times, with so many Shamoutras like BennyGanz, who keeps kosher anymore?